Way back in 1852, the Lake County Agricultural Society started the fair as a way to showcase the achievements of agriculture in the county. Back then, it was a way for the people of the county to gather for some good fun and a little competition. 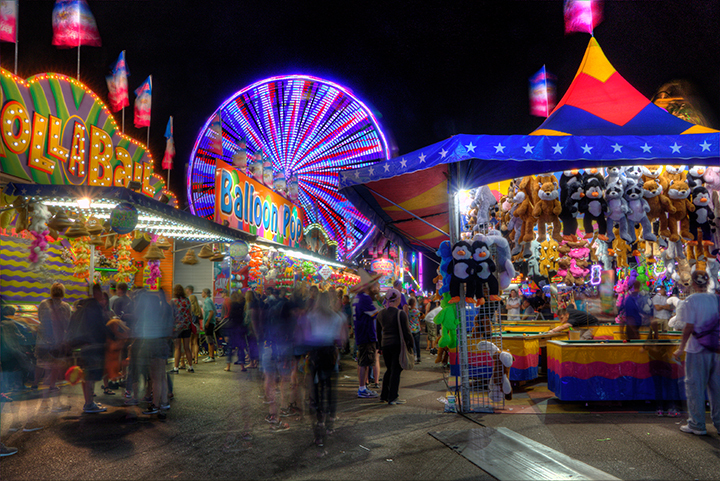 Agriculture is our theme, but there is so much more...We have a huge Carnival, great Entertainment, exciting Grandstand Shows, graceful Horse Shows, Farm Animal Shows and Exhibits, Free Petting Zoo, Contests for kids and adults and lots of great food. We also feature the projects from the local Lake County 4-H Club Members. These projects range from cattle to sewing, and electric to rocketry. The 4-H building is full of these projects so you can see what the youth of Lake County can do. Let's not overlook the adults in the county. Our Family Arts and Crafts Building is brimming with exhibits from the talents in the county. Photography, Quilting, Woodworking and much, much more. In addition, there are exhibits from the gardeners in the Flower Show Building and the Agriculture Building, along with the outdoorsman exhibits in the Conservation Building.